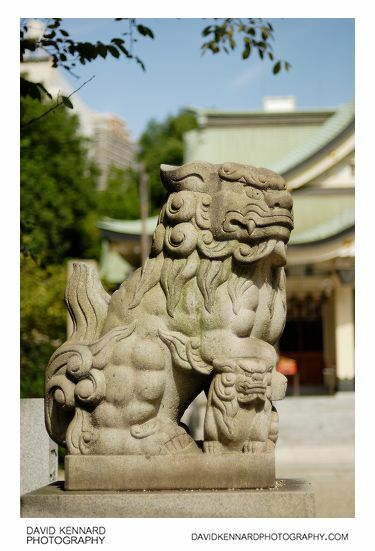 This is another komainu (狛犬) guardian lion statue at the shrine. 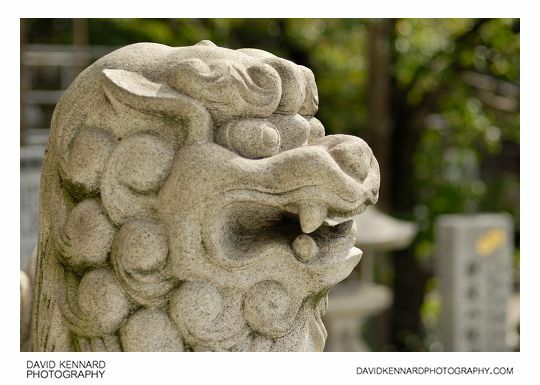 Unlike the other komainu statue outside the shrine, this one is stone. Although the style is similar to the other statue, the design still manages to be quite different. At Namba Yasaka Jinja, and most other shrines, they have racks with lots of Ema (絵馬) hanging from them. 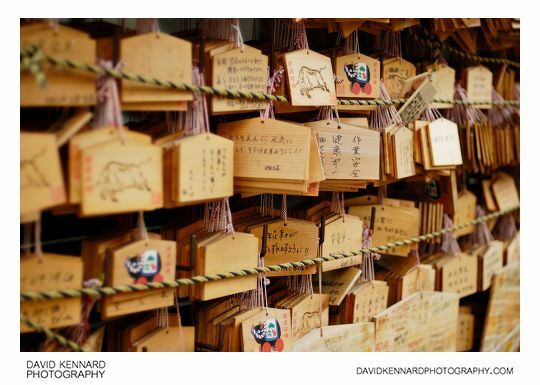 These are small wooden plaques that you can purchase from the shrine and write your wishes on. Then you would leave the plaque hanging up at the shrine for the kami (god or spirit) to receive it. The Ema are sold with a pre-printed picture on one side, and the other side blank for you to write on. The ones displayed at Namba Yasaka shrine either feature a picture of a bull or a bull on wheels. I think this is probably related to 2009 being the year of the bull according to the Chinese Zodiac. This photo again suffered from the back-focusing issue with my camera - the poster on the tree was where I focused, but the actual focus is slightly behind this. The poster features a cute cartoon dog saying ふんの始末は 飼い主の義務です (Disposal of feces is the duty of the owner). I've not seen any clean up after your dog posters like that in the UK. 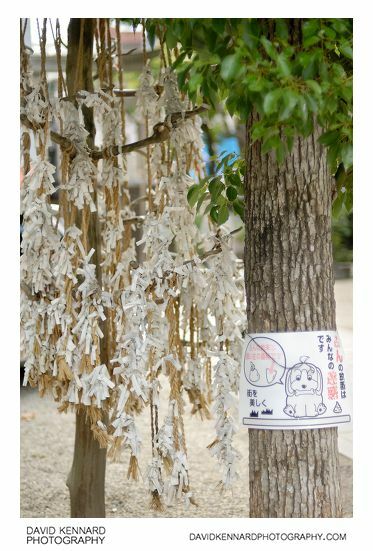 Behind the tree are hanging ropes with small strips of paper called Omikuji (御御籤, 御神籤, or おみくじ) tied to them. 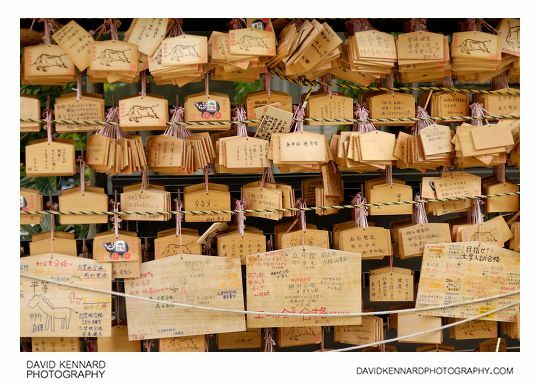 Omikuji are purchased from the shrine, and have fortunes written on them. If the fortune is good, then you could take it home with you. Otherwise if the fortune is bad, you tie it up at the shrine, and leave your bad luck at the shrine. 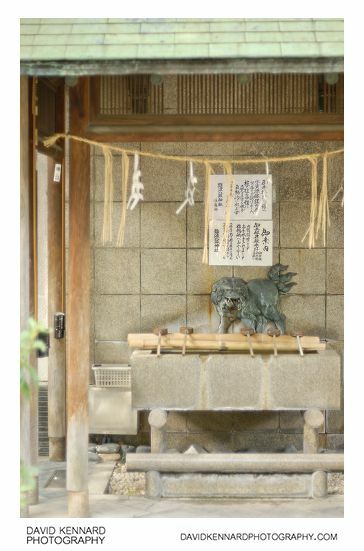 This is another stone komainu at the shrine, this one has a little baby komainu with him. The last photo I took at Namba Yasaka shrine was of the temizuya (手水舎) (also known as chōzuya), which is a small pavilion where worshipers can carry out the temizu water purification ceremony. At Namba Yasaka, the water for the basin comes out of the mouth of a bronze lion who is attached to the wall.